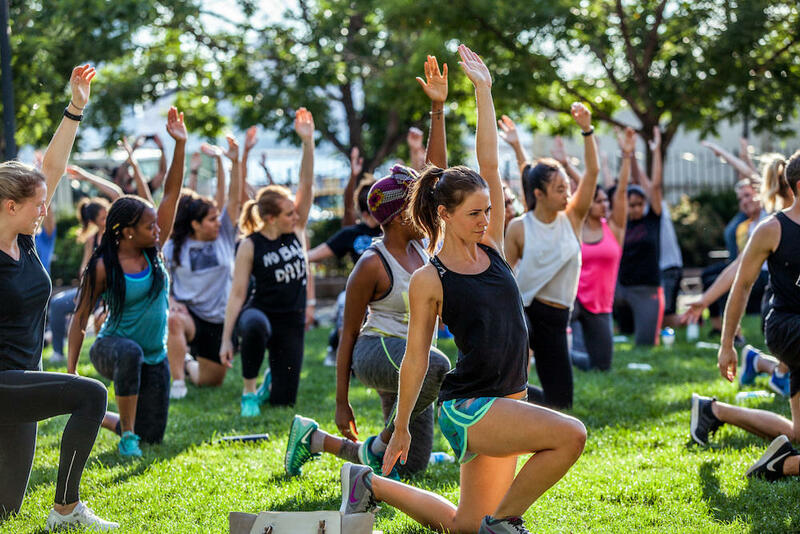 Join the Meatpacking BID and the Wellth Collective for a fun al fresco fitness series consisting of three free 45-minute classes at 6pm, 7pm and 8pm nearly every Tuesday night, starting May 22 through the end of August. Classes will consist of a variety of modalities including yoga, bootcamp, dance cardio, boxing, pilates and more. The Sweat Sessions will take place at Hudson River Park’s 14th Street Park, located on 10th Avenue between 14th and 15th streets. This season, The Sweat Sessions will raise awareness and dollars for Exhale into Inhale, a nonprofit that empowers those affected by domestic and sexual violence to transform their lives using the healing practice of trauma informed yoga, while helping communities to develop skills and knowledge to support them. Proper athletic attire must be worn. Late show ups may be subject to forfeiture. Mats are available on a first-come basis. Notices of cancellation or postponement due to weather conditions will be emailed in advance of class. PLEASE STILL CONSIDER DONATING TO TUESDAY'S CHILDREN. to support families who have been affected by tragedy and terrorism. No 8pm class. It gets too dark. The Cool Downs at Samsung 837 have ended for the season! But there's much more to do at the experiential hub. Check out their upcoming events for more happenings. Sips and bites will be hosted at local retailers for the rest of summer. Locations will be announced on site. *Limit one goodie bag and card per profile. September 4 at 6pm. Don't have an OkCupid profile? Sign up here. Proper athletic attire must be worn. Late show ups may be subject to forfeiture. Notices of cancellation or postponement due to weather conditions or otherwise will be emailed in advance of class. The Meatpacking Business Improvement District (BID) is the not-for-profit business alliance of the area whose mission is to support the business community and to keep the area clean, safe and beautiful for locals and visitors alike. The BID represents and promotes the area’s business interests, produces events and manages a robust marketing and public relations campaign for the neighborhood. For more events happening in the Meatpacking District, check out the area's digital neighborhood. The Wellth Collective is the premiere healthy hospitality and wellness experience design firm. With health becoming the new currency as today's measurement of success, The Wellth Collective's mission is to empower others to discover their own definition of 'wellth' and continue on their journey of self discovery. to live their best lives. Through a time-tested, long-term approach, Tuesday’s Children programming serves and supports our nation’s military Families of the Fallen; builds resilience and common bonds in communities worldwide recovering from tragedies, while keeping the promise to support all those impacted by Tuesday, September 11th.